I’ve been making this since my oldest child turned eighteen months old. My boys gobble it up every morning and often ask for seconds! 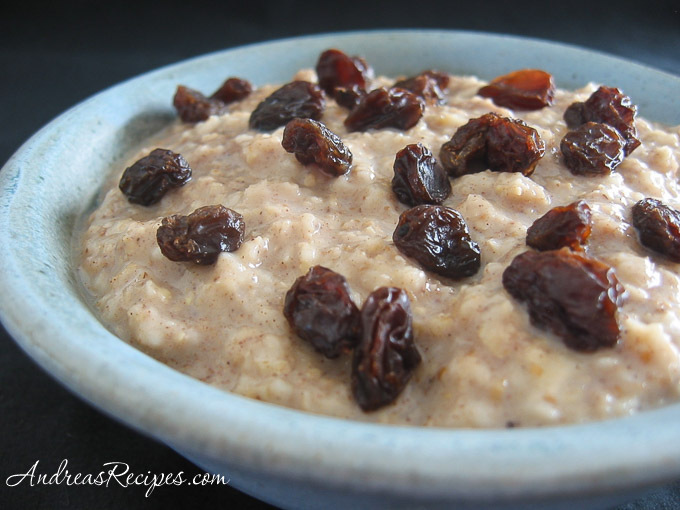 This is thick, hearty, stick-to-your-ribs oatmeal that is made from scratch, but it’s super easy and the recipe makes enough for several days. I make it thick because it sticks to the spoon, thus helping little ones to scoop it up while learning to feed themselves. Warning: This recipe uses honey, which is not safe for children under the age of 1 year. In a large glass bowl combine oats, wheat germ, oat bran, and cinnamon. Add applesauce and. Stir. Cover bowl with plastic wrap and poke three holes with a sharp knife. Microwave on high for two minutes, then stir. Microwave on high for two more minutes. Add honey and stir. Cover again and allow to sit for 15 minutes. Stir well and put into refrigerator. The oatmeal will keep for several days. TO SERVE: Warm 1/4-1/2 cup of oatmeal (depending on your child’s appetite) in the microwave 30-45 seconds. It won’t be hot, just slightly warm. Pour into a bowl and serve. Sometimes I add 2 tablespoons of cracked wheat to the mix, which requires an extra 1/4 cup of milk. For older kids, sprinkle raisins or dried cherries or cranberries on top before serving.